It is with diverging feelings of sadness and joy that we say goodbye to Colleen as she leaves us for the satisfying pace of retirement. For the past 13 years she has been the force that guided Faculty Affairs, and since 2013, the Human Resources department as well. Colleen joined Humboldt State 34 years ago as a full-time lecturer. A few years later, after receiving her Ph.D. in System Science Management from Portland State, she returned for a tenure-line position in the Department of Business and Economics. As a faculty member, Colleen served as a Department Chair, Academic Senate Chair, and CFA Faculty Rights Chair before moving to an administrative role in 2005. Colleen has shared with us her love for most four legged creatures, her traveling experiences, her appreciation for art and a wide array of intriguing television shows. We will miss her expertise, integrity and her vision for moving the department forward. We will also miss her friendship, her time for each one of us, her positivity and compassion. Please join the HRAPS department and the President’s Office to celebrate Colleen’s contributions to Humboldt State on Friday, August 10, from 2 to 3:30 pm at the Corbett Conference Room in Siemens Hall. Concern about the impact of a presentation can inspire presenters to raise their game, enabling them to get the desired results. A presentation can be immeasurably improved if the presenter devotes sufficient time and attention to planning. In this course, you'll learn how to define and understand your audience's characteristics, knowledge, needs, and responses. You'll also learn how to organize your presentation's timing, purpose, key points, and approach. Finally, you'll learn about different presentation methods and when they're most effectively used. Neighborhood taught kids critical emotional and social skills that are still relevant to adults today. Here are some of Mister Rogers' teachings that could help us weather today's ups and downs, stand up for what we believe in, and work together as we prepare for the Fall Semester. 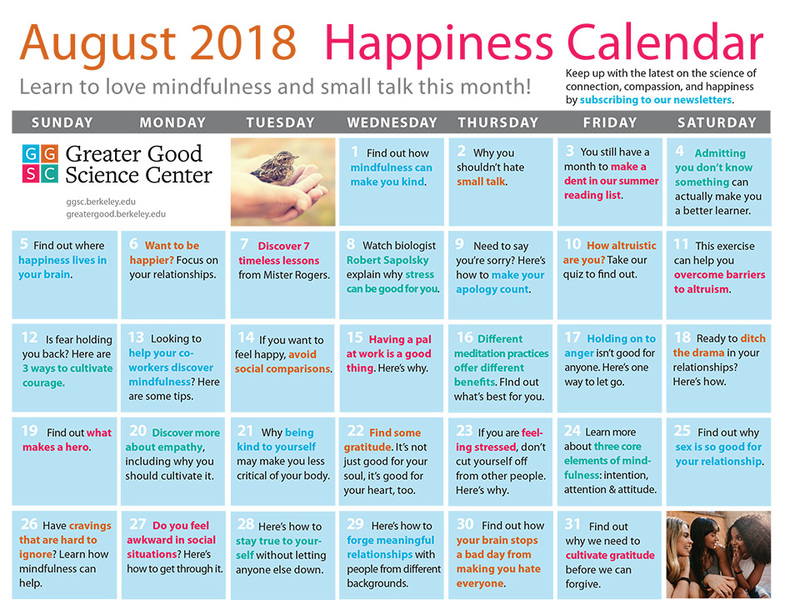 Find laughter, creativity, and happiness in your day by downloading this well-being calendar guide for July. Have you ever thought that you could be the best boss you've ever had? By developing attitudes and skills that empower you, you can manage from within and become your own best boss. Self-empowerment is the process of taking responsibility for your attitudes, behaviors, and actions at work to maximize your effectiveness. As an empowered employee, you will be driven by ownership, initiative, and performance. This course focuses on attitudes and behaviors that promote self-empowerment. It provides strategies for empowering yourself through self-coaching, approaches for developing an entrepreneurial mind-set, and an opportunity to apply a model for self-empowerment to enhance your performance. Applying these approaches will help you become a self-empowered contributor in your organization. Sociologist/productivity and relationship coach and expert Dr. Jan Yager offers a 7-day plan to get more done in less time. This revised and updated book covers everything from assessing how productive you are right now, goal setting, prioritizing, to getting over procrastination, perfectionism, poor planning and pacing, 9 other time wasters, organizing, decluttering, teaching time management to your children and teens, work-life balance, and lots more. This is an opportunity for faculty and staff to come together for professional development that inspires, builds community, and offers equitable and inclusive learning opportunities to integrate into practice in the coming year. Enjoy a light lunch and live music by For Folk Sake!, a welcome session, and workshops. A quick way to search a key phrase or word on a web page is to use Control-F on PC or Command-F on Mac. A search bar will appear at the bottom or top of your page depending on the computer or browser you use. Type the word or phrase in the search box and by default the words will be highlighted on the webpage.